The haunted Mordecai House has been the subject of attention among those interested in the paranormal for several years throughout its history. Located in Raleigh, North Carolina, this structure has been documented in being the oldest among all residences in the area. When looking at this particular structure, you can take a glimpse into the historical past associated with plantations that were common to the area. Constructed by a man by the name of Joel Lane, this structure is named after the husband of Joel’s granddaughter, Margaret. His name was Moses Mordecai. In this haunted places to go ghost guide, you will learn about the haunted Mordecai House. 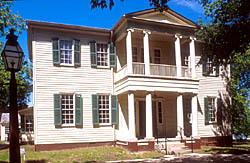 In the 1780’s, the Mordecai House was constructed. The man who completed this task was named Joel Lane. He wanted to design a home for his son, Henry. Nearly a decade after construction efforts were completed, Joel Lane agreed to sell a large portion of his land to the State of North Carolina. Today, this land serves as the capitol, Raleigh. Henry Lane had two children, both girls. Their names were Margaret and Ann. Moses Mordecai originally married Margaret Lane. Unfortunately, Margaret passed away. At that time, Moses asked Ann Lane to marry him, and she accepted. Moses had three children from his marriage to Margaret. The names of these children were Jacob, Henry, and Ellen. He and Ann had one daughter in which they paid tribute to Margaret on and named her Margaret. Moses was a lawyer during all of this and acquired quite a bit of wealth for himself. He eventually had the southern plantation transformed into a mansion that reflected Greek revival architecture. In the year of 1824, Moses Mordecai passed away, leaving his estate and riches to his family. His love and endearing attitude resulted in the plantation being called the “Mordecai House”. A lady by the name of Mary Willis Mordecai Turk is a descendent of Moses Mordecai. She is one of the five generations of individuals in this particular family to have acquired possession of the lavish structure that so many of her relatives called “home”. Mary lived during the 19th century. We know that she enjoyed activities that related to socializing in and around her beautiful home and that she enjoyed playing the piano. Despite the fact that Mary Willis Mordecai Turk passed away, many believe that her spirit still lingers at the haunted Mordecai House. Most of the hauntings that are said to occur at the Mordecai House revolve around the famous Mary Willis Mordecai Turk. Many individuals have heard the sound of the piano playing only to discover the appearance of a female apparition sitting at the musical instrument. This apparition is said to consist of a gray mist-like substance. While the evidence of spiritual mist is present, these same individuals can clearly describe what appears to be dress that was considered to be standard in the 19th Century, as well as physical details of the female playing the piano. Historians who have taken an interest in the home believe that the descriptions match what Mary Willis Mordecai Turk would have looked like at the time she owned the plantation mansion. Once Burke Little, the last of the generations of the family, passed away, the home was turned into a landmark and tours were established so that individuals in the area could experience the rich culture and history of the plantation. However, many unusual events began to occur. One example of these incidents was noted by tour guides and tourists alike. Throughout the home, several pictures of the individuals who resided in the home were hung. As tour guides mentioned certain names of those pictured, the pictures seem to fling themselves off of the walls. If you are interested in visiting haunted places throughout the United States, the haunted Mordecai House in Raleigh, North Carolina should be at the top of your list. The spirits in the home do not seem to be violent, only searching for a hope that they may pass from what they have always known to a place that offers them peace.